BURNABY, B.C. 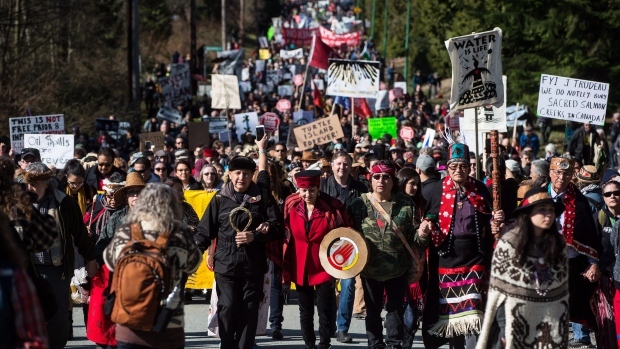 -- Protesters around Vancouver held duelling rallies on Saturday, some welcoming Kinder Morgan's Trans Mountain pipeline expansion project with others decrying it. Several hundred pro-pipeliners, including a bus load of Albertans, gathered downtown to show support for the resources infrastructure -- just hours after First Nation leaders marched with thousands of anti-pipeline activists in Burnaby, B.C. "My family was food gatherers. We gathered clams, crabs, oysters fish -- everything. That's how I grew up. Now we can't even do that," Nahanee said. "We need to stand up and hear our voices. My voice is: O, Canada, you're on native land." "The fact is, the Kinder Morgan pipeline already exists -- it has been delivering oil to the port of Vancouver safely for over 60 years, and carrying diluted bitumen for three decades. This project would simply add capacity to the existing pipeline, and we've set 157 binding conditions to ensure it can be constructed and operated safely," Wilkinson said.